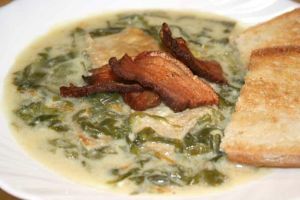 Supa de Salate | Lettuce Soup is a Romanian food recipe cooked with bacon and garlic. Bring to a boil 2 quarts of water to which has been added the juice of a large lemon, 4 large crushed cloves of garlic, one tablespoonful of finely chopped parsley, one large tablespoonful of butter or lard and salt and pepper to taste. Cover tightly and boil gently. Now put into a bowl one heaping tablespoonful of flour and mix into it very well the yolks of 2 eggs and 3 tablespoonfuls of heavy sour cream. Thin with some of the boiling water, added slowly, little by little, and in the meantime stirring constantly and quickly so you will not scald the eggs. Pour this thinned mixture into the boiling pot, stirring constantly. Bring to a boil, reduce the fire and let simmer slowly. Wash thoroughly one large crisp head of lettuce, break into large pieces with the hands and place the pieces in a pot. Bring the soup to a boil again, turn off the flame, and pour the soup over the lettuce. Let stand on the warm stove. In a heated iron pan fry bacon and cut into small pieces until crisp. Add a few sprigs of green garlic, finely chopped (or one clove of crushed garlic) and one tablespoon of chopped green parsley and sear quickly. Scramble 3 or 4 well-beaten eggs in the pan, mix well and then put into the soup. Cover and let stand for 3 to 4 minutes, then serve at once in heated soup bowls, topped with sour cream. If you desire it more sour, add more lemon juice or vinegar.